This article is about the refuse of society. For other uses of the term Garbage, please see Garbage (disambiguation). Garbage in public park during Toronto garbage strike. Garbage, trash, or (in British English) rubbish, is the byproduct of the disposed waste created by a society. The terms garbage and rubbish are more or less a 'catch-all' term for items that are viewed as disposable, or that can be "thrown away". Other terms that may be used to describe garbage are waste, litter, and refuse; however these terms often mean something specific when used in appropriate context, e.g. human waste. Worldwide, about 1.3 billion tonnes of municipal solid waste are generated every year. The largest percent of municipal waste is generated by the United States (19%), followed by China (14%). The next four countries together, the Russian Federation, Japan, Brazil and Germany, make up about 18% of world municipal waste. In addition, trash, or waste, is the source of 3-5% of emissions generated from human activity. Garbage, once disposed of, is usually collected by a waste-management company (which may be a municipality) or a privately run contract, depending on the agreement made by the government of the city, county, state, or country. After it is collected, it is hauled away by trucks to either dumps (also known as landfills), or to processing facilities where it is then filtered of recyclable materials and then incinerated, pulverized, or deposited at another location. Disposal of trash can be a problem in itself: if not managed correctly, sites where trash is deposited can over-run into the main populace areas of the city. Throughout history, there have been creative ways of disposing of trash. One option is to mix layers of solid waste (non-liquid and non-gaseous waste) with layers of soil. 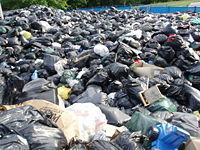 This was done to create Mount Trashmore Park, located in Virginia Beach, VA.. Mount Trashmore is approximately 165 acres of composted trash, reaching 60 feet high and spanning over 800 feet long. In many parts of the world, trash is burned. Unfortunately the gas produced by the burning of trash is often toxic and poses an environmental and health hazard; so much so that the EPA has established a website that includes links to laws, regulations, and hazards. Not all trash is created equal. In the United States, there are laws and regulations that determine how specific kinds of trash much be handled. For example: medical waste(items such as needles, test tubes, gloves, testing materials) is classified as "biohazard" materials and must be handled appropriately. Even household chemicals, and containers, for such things as drain cleaners and paint must be treated as hazardous materials. Discarded electronic equipment both may contain hazardous materials such as mercury, as well as traces of gold plating and other materials that economically justify separate recycling. With an increasing recycling movement, more and more separations are used. "Trash" tends to imply dry material and "garbage" wet (e.g., food waste). Dry materials, based on different recycling, may be sorted into conventional paper, glazed paper (e.g., magazines), cardboard, plastic, glass and aluminium. There are also a number of ways that trash can be used creatively. Several examples include Trash Art, Trashion (fashion made from trash) and trash-to-treasure programs for children. Quite a number of artists use trash in fashion design. For example, Marina DeBris used rope, nets, canvas from the Great Pacific Garbage Patch to make a corset and hoop-skirt outfit for an ocean education festival, and used styrofoam coffee cups and containers, and paper plates, to make a dress to benefit sustainable arts education. Four University of Michigan students used materials they found in trash cans around campus to create a “trashy” cloths line. Airports display dresses made by Nancy Judd out of material such as broken glass or junk mail. A number of artists will be making political statements about trash through a fashion trash bash to benefit an environmental sustainability organization. In this case, the cloths they make are made out of Vietnamese pig food bags, plastic shopping bags and water bottles. ↑ World Bank (no date given). What a Waste: A Global Review of Solid Waste Management. World Bank. Retrieved on 2013-8-18. ↑ Environmental Indicators: Waste. United Nations Statistical Division (March 2011). Retrieved on 2013-8-20. ↑ United Nations Environment Program (November 2010). Waste and Climate Change – Global Trends and Strategy Framework, Nov 2010. United Nations Environment Program. Retrieved on 2013-8-18. ↑ Mount Trashmore Park:Virginia is for Lovers. Virginia Tourism Corporation. Retrieved on 2008-01-10. ↑ Backyard Burning / Wastes / EPA. United States Environmental Protection Agency (2007-09-04). Retrieved on 2008-01-10. ↑ Bennett, Sarah. Community Briefs: "Aquarium's Urban Ocean Festival Educates With Trash Fashion, Local Seafood and Art. ", May 3, 2013. Retrieved on 2013-08-15. ↑ Leonardo, Kathy. "The Fashion of TRASHion Lights Up Downtown LA", June 2012. ↑ Veronica Menaldi. "Art and Design students turn trash into fashion", December 8, 2008. ↑ LaMont Jones. "Trash fashion: Nancy Judd's sustainable styles bring message of recycling to cities' runways. ", August 11, 2008. ↑ Nicole Tsong. "Trash Fashion Bash - Where politics and fashion (wink, wink) meet", November 15, 2007. This page was last modified 11:38, 12 September 2013.